Avant-garde is a French term originally used to describe “the foremost part of an advancing army or naval force” (Oxford English Dictionary Online-vanguard), but has since been appropriated to indicate “new and experimental ideas and methods in art” (Oxford English Dictionary Online-avant-garde). The Latin American avant-garde art has a rich and colourful history that often remains overlooked by Western academia. It is characterized by an awareness of and reaction to the region’s turbulent and sometimes violent social and political history. Avant-garde artists are seen as being on the forefront of the boundaries of artistic practice, experimenting before the public is able to catch up. They are not bound by the strict rules of academic realism that was so popular in the past and thus have the luxury of depicting subject matter that is not instantly recognizable. This opportunity for personal subjectivity promotes aesthetic experimentation leading to evolution of the artistic process (Ramirez and Olea, 2004). The avant-garde rises to the challenge of resolving various conflicts within the creation and appreciation of art. In Paraguay, for example, artists sought to resolve “the opposition between the autonomy of form and the expression of meaning” (Sullivan, 1996). Latin American avant-garde artists deserve the same level of acclaim awarded to Western artists. What is specifically Latin American cannot be easily designated, but the term has come to signify artists residing in Latin America and artists from Latin American who currently reside in other regions (Sullivan, 1996). The vast amount of ethnicities, cultures and experiences denies the possibility of a universal artistic style, thus all Latin American artists cannot be confined to a particular movement. A key element of Latin American culture, which in turn is represented in its art, is hybridization. A mix of ethnicities come together to contribute different elements, creating a rich and unique culture. Although Western artistic practices have been key in igniting artistic experimentation in Latin America, Latin American art remains its own distinct entity and is not derogative of or lesser than Western art. Indigenous, or pre-Colombian, art also contributed techniques and inspiration for avant-garde practices, but it too is a separate genre. Artistic experimentation in Latin America is known for expressing strong values concerning the social realities experienced by its people. 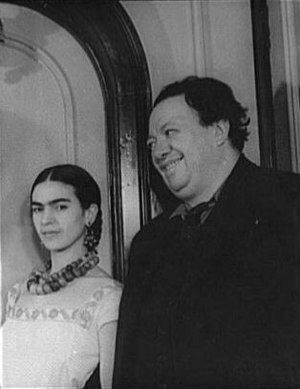 To use Diego Rivera as an example highlights his method of involving the integration of his personal political values into his art. A supporter of communism, Rivera included Vladimir Lenin in his mural “Man at the Crossroads,” despite disapproval from his American clients. The mural was destroyed before its completion but Rivera went on to recreate it back in Mexico (Lucie-Smith, 1993). There also exists in Latin American culture a shared experience among many a sense of marginalization and dislocation, whether literal or not. Cuban artist Ana Mendieta, for example, was sent away from her family during her childhood to the United States. This sense of exile never left her and is a recurring theme in her work (Sullivan, 1996). These are two examples of artistic practice that push established boundaries and draw the public forward with it. Another way that the political circumstances affect artistic development is the state of the government. The multiple coup-d’états in Brazil not only influenced the opinions of artists but also determined how free they were to express them. Under the rule of Brazilian dictator Getúlio Vargas from 1930 to 1945, for example, there was state support for art because it was seen as a promotion of nationalism (Sulllivan, 1996). Consider a different region: Rivera’s murals in Mexico may not have been so successful if they had not been sanctioned by the state. The political circumstances have a significant effect on the direction and strength of artistic experiment. Writer Ferreira Gullar said that “avant-garde art should spring from an analysis of a given country’s social and cultural characteristics, never from advanced ideas imported intact from the developed countries to which they properly apply” (Traba 1994). This sentiment describes the appropriation of Western art into the Latin American avant-garde. Artists work with and further develop movements that are prominent in Western art into their own experimentation, changing Western practices into one that reflects Latin America. As well as partaking in these established movements, the Latin American avant-garde creates some of its own, such as Constructive Universalism – the combination of a variety of movements such as Americanism; Primitivism and Classicism – and Muralism (Sullivan, 1996). Because of the many influences of different ethnicities from within the continent, Latin American art production is a fluid and malleable process of hybridization, using the land’s colonial history and the indigenous, European and African ancestral elements of the culture and people to contribute to the overall artistic practices. Foreign influence also comes in the form of immigration and international study. This hybridity is what makes the Latin American avant-garde unique from the artistic experimentation present in other areas of the world. Avant-garde art in Latin America pushes the limits through a process of being inspired and influenced from both within and beyond its own culture. Avant-garde art in Latin America is its own ground-breaking discipline, not a derivative of Western practices. As a result of the varied ethnicities and influences that became a part of the culture as the region broke away from its colonial past, this hybridization unique to Latin America presents a particular cultural experience that influences artistic practices. Avant-garde experimentation also benefits because of a personal experience with the shared political circumstances that often lead to social unrest. This awareness is expressed in many of the works of the region. Latin America possesses a strong avant-garde that deserves its own recognition alongside Western art with artists who use their political awareness and personal or cultural hybridized backgrounds to push artistic experimentation forward. Chaplik, Dorothy. Defining Latin American Art / Hacia una definicícion del art latinoamericano. Jefferson, North Carolina: McFarland and Company, Inc., Publishers, 2005. Print. Dezeuze, Anna. “Border Crossing.” Tate etc. Summer 2005. Web. Lucie-Smith, Edward. Latin American Art of the 20th Century. London: Thames and Hudson Ltd., 1993. Print. Lucie-Smith, Edward. Visual Arts in the Twentieth Century. New York: Harry N. Abrams, Incorporated: 1997. Print. Ramirez, Mari Carmen, and Héctor Olea. Inverted Utopias: Avant-Garde Art in Latin America. New Haven and London: Yale University Press, 2004. Print. Rodríguez, Eduardo Luis, John Beusterien, and Narcisco G. Menocal. “The Architectural Avant- Garde: From Art Deco to Modern Regionalism.” The Journal of Decorative and Propaganda Arts 22 (1996): 254-277. Web. Sullivan, Edward J. Latin American Art in the Twentieth Century. New York: Phaidon Press Limited, 1996. Print. Traba, Marta. Art of Latin America: 1900-1980. Baltimore: John Hopkins University Press, 1994. Print. This entry was posted in avant-garde, Brazil, Diego Rivera, ethnicity, experimentation, hybridization, indigenous, Paraguay, social and political history, Uncategorized, universal, Vladimir Lenin. Bookmark the permalink.